It is a professional conversion software which can convert all popular video formats (such as AVI, DivX,3GP/3GPP,Xvid, MPG, MPEG-1,MPEG-2, FLV, MP4,M4V, VOB, WMV, ASF, MPEG-4 AVC,H.263, H.264) to PSP movie (PSP MP4 video, PSP H.264/AVC video), PS3 Video MPEG-4, and MP3 audio. Convert video with HD video conversion supported.You can customize the output size, video quality, and parameters for output media files. Offers you the highest conversion speed. Offers additional ingenious features of editing, you can clip your favorite video segment from a movie, crop the video window, and increase the outgoing volume of the media file. It also supports batch files converting. 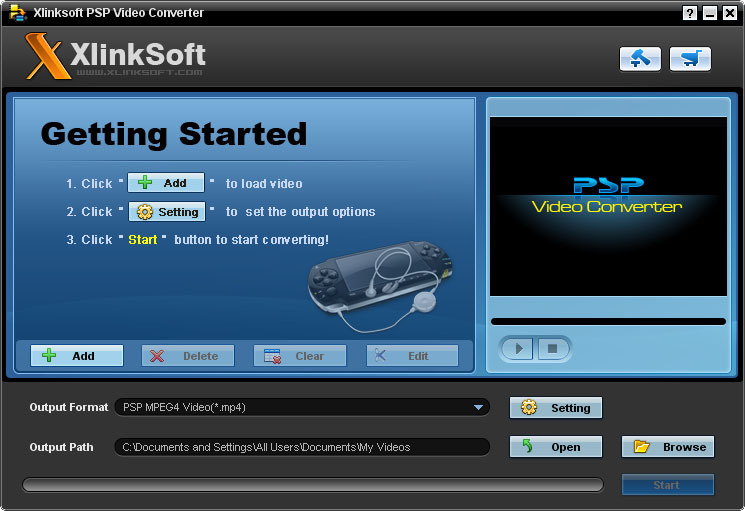 Download Xlinksoft PSP Video Converter and enjoy your favorite movie with PSP anytime and anywhere! Possessing PSP Video Converter, you will have a wonderful and extensive digital entertainment life. 1.Supporting multi-core CPU and multi-threading for each task, this PSP video converter offers you the highest video to PSP conversion speed. 2.Intuitive interface, convert video easily for you. 4.So many PSP video conversion settings are adjustable to convert PSP video files, such as window dimension, video quality, bit rate, frame rate, etc. 5.Variety of default PSP video profiles allow you to minimize the routine and do the job that requires hours in just a few minutes. 6.Provide rich profiles, customize and save your profile for future use.